Lois Culpepper (21) and Alton Pack (22) on 29 Oct 1939 in Walker Co., GA, 14-414. Hoyt G. Culpepper (23) and Toledo Starr Ramsey (19) on 27 Oct 1945 in Walker Co., GA, 28-303. E-mail written Jul 2005 to Warren Culpepper from Joyce Marie Culpepper Bryson, Chattanooga, TN, e-mail address. Katherine W. Culpepper (21) and William H. Knight (21) on 24 Feb 1945 in Walker Co., GA, 26-213. Billy H. Culpepper, d. 13 Aug 1987 at 54 years in Catoosa Co., GA; Res. in Walker Co., GA.
E-mail written Feb 2008 to Warren Culpepper from Donald Edward Smith (#58143), e-mail address. "William 'Will' Garland Culpepper (Hager) was my grandfather's father. My grandfather was James John Culpepper (Hager), Sr. (We always called him 'Pop') His oldest son, James J. Culpepper, Jr., was my father. We know nothing about Will's family. Pop told us that his Dad was very close to an uncle named Jim Culpepper and 'took' the name. Pop also told us that 'Uncle Jim' got into a fight and killed a man, ran from the authorities, joined the merchant marines, and ended up somewhere in S. Africa. It has always been a mystery to the whole family. Pop and Uncle Dan were baptized under the surname 'Hager' at Sacred Heart Church in Augusta. From all I have heard Will was a scoundrel. Pop told me that he left Mom (Marguerite Bolster), Uncle Dan and himself in a boarding house and arranged for them to have one meal a day, not a meal each, but one meal. Ms. Mag (Marguerite ) divided the meal between Uncle Dan and himself and basically starved herself. Pop and Uncle Dan's mom contracted a disease, and died. 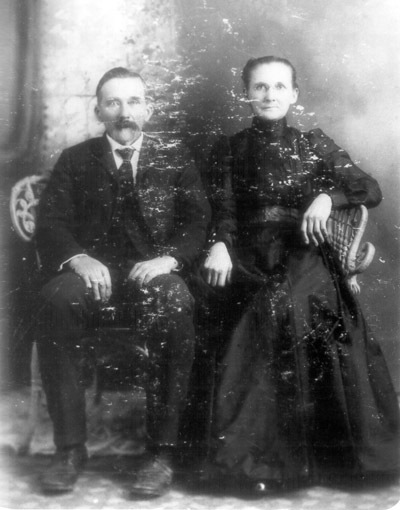 Ma and Pa Bolster, Ms. Mag's parents, raised Pop and Uncle Dan. My guess is they knew him as a 'Culpepper' and raised Pop and Uncle Dan as Culpepper's. 15 Nov 1898, page 15A. " Fifth Ward, Whites: Wm. G. Culpepper, 1548 Broad." 6 May 1933, Page 2A. Obituary of Miss Mary Margaret Culpepper, 7-year old daughter of M/M Dan W. Culpepper. "Paternal grandfather, W. G. Culpepper of West Plam Beach, FL." William Garland Hager, Box 565, West Palm Beach, Palm Beach Co., Florida. Age 42, born 7 Oct 1875. White, natural born citizen. Occupation: Sash & Door Maker for Dade Lumber Co. Nearest Relative: Amy Lois Hager, Box 565, West Palm Beach, Palm Beach Co., Florida. Medium Height, slender buildbrom eyes, brown hair, two fingers crippled on left hand. Registered 12 Sep 1918 at West Palm Beach, Palm Beach Co., FL. E-mail written Aug 2007 to Culpepper Connections from Susan Van Ord, (via Ancestry.com message service). 27 Oct 1902, page 6A. " Fifth Ward, Whites: Wm. G. Culpepper, 28, 1611 Broad." William G. Hager Jr., White, Male, died 1925 in Palm Beach Co., FL. James John Culpepper - sailor, policeman, bouncer, construction worker, turnkey, and family man, has decided to retire after near 39 years in law enforcement. The witness to more than 68 summers turned in his keys and company property at the county jail Tuesday midnight to wind up nearly 14 years with the sheriff's department. This will be the closing of only one of several chapters in the congenial lawman's career. The story started Jan. 15, 1898, when J. J. Culpepper bounced into the world - a native Augustan. He was early made an orphan by the death of his parents. He was raised by his grandparents, Mr. and Mrs. Dan Bolster. At the tender age of 16 he enlisted in the U. S. Navy, during World War I, and served four years. He spent hundreds of days and nights aboard the USS Potomac patrolling the islands of the Caribbean and West Indies, which affords paled pages of memories. The war ended and young Jim came home. He went to work for the Charleston and Western Carolina Railroad. The paydays did not last long. The creeping effects of a developing depression caught him soon without a job. In the meantime he had entered a new contract. He took Pearl Tinley in marriage. Along came Sarah. Next was J. J. Jr., and then Ray Culpepper. Jim Jr. is now Lt. J. J. Culpepper of the Augusta Police Department. His daughter is now Mrs. Sarah Cordell of Clearwater, Fla. Ray Culpepper is now a parts foreman for Alcoa in Nashville, Tenn. They have added to the family - to the number of eight grandchildren and there is one great-grandchild in the family. He shook his head when he spoke of joining the Augusta Police Department in 1921. He said. "After walking the street job hunting for about six months a little prayer came to me. I asked God if he would help me get another regular job, I would never quit." He never did, not even in the face of job offers with much greater pay than police work. Scanning through the pages of time he said. "Crime was far less in those years. A juvenile delinquent was something you hardly heard of. Now its one of the biggest headaches." He said, "The rise of juvenile delinquency in recent years is mostly the fault of parents. Police work is getting tougher and harder all the time. So many young boys leaving home are influenced by the elements they meet in the 'outside' world." Pearl E. Culpepper, Daughter, F, 20, F, GA.
12 Dec 1924, page 5A, Obituary of Mrs. Sarah B. Tinley, died 11 Dec 1924, Augusta, Richmond Co., GA.
Jesse W. V. Tinley, died 29 Jun 1942 at 72 years in Richmond Co., GA.
Daniel Culpepper, Boarder, M, 19, Md, GA/GA/GA, RR Laborer. Photographed* say 1895� She was photographed say 1895 at Randolph Co., Alabama. Mother (Culpepper)__Mattie L. Perry was born in Merriweather Co Ga Sept 12 - 1846. Martha Perry 73 GA mother-in-law. Location Mrs. A. T. (Kathleen Perry) Pickett letter 4 Jan 1979. Mrs. D. W. (Lavyn Wright) Sisco wrote 5 Jan 1978 that Mattie was buried at "Potosi, 15 miles north [south east] of Abilene, Texas."